In e-commerce users should never be forced into creating an account, just to place an order — our research shows that up to 37% of users will abandon a checkout due to being forced to create an account. However, when offering a guest checkout, where in the checkout flow is it best to show users any optional account creation? Our large-scale checkout usability testing consistently shows that having the site’s optional account at the end of the checkout process, on the “Thank You” order confirmation page, is the best place in the checkout flow to ask users. Yet, our checkout benchmark shows that 38% of e-commerce sites don’t offer users the chance to create an optional account at the order confirmation step. While there are clearly business reasons for wanting users to create an (optional) account, our research has shown there are also benefits for the end user — mainly the convenience of reusing the information for any orders later on (e.g., shipping address, payment method, etc.). Individual user accounts are a core feature of e-commerce. In fact, our checkout usability benchmark data show that 100% of sites allow users to create a user account at the site. The business case for user accounts is clear: when users have an account at a site, they may be more personally invested in shopping at a particular site and are thus more likely to return for future shopping visits. Therefore it’s not surprising that offering users the ability to create an account at a site is ubiquitous among the top 50 US e-commerce sites. 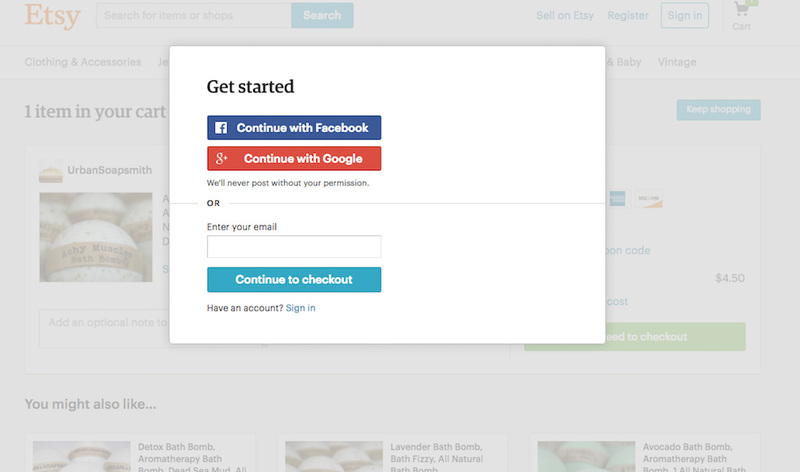 Etsy requires users to sign up for an account in order to complete a checkout. Up to 37% of users will choose to abandon rather than be forced to create an account. However, while there’s nothing wrong with offering users the chance to create an optional account, our research has found requiring users to create an account in order to check out will result in abandonments. And yet 14% of sites require users to create an account in order to check out, running the risk that up to 37% of users will choose to abandon rather than be forced to create an account. Additionally, it’s not just users without accounts who benefit from being able to check out as guests. Some users with existing accounts will run into trouble when they forget their account password. Our usability testing indicates that as many as 18% of account users will abandon due to password issues — unless they have an option to complete the purchase as a guest. It’s crucial therefore that, before considering where and how to ask users to create an account, a guest checkout option is provided for all users, allowing those users who aren’t interested in creating an account (or who can’t access their account) to still be able to complete a purchase. Northern Tool offers users the chance to create an account at the billing address step, running the risk of some users becoming distracted from their primary goal: completing the checkout. Even if account creation is only a password field, users can still have issues if in particular their preferred password can’t be used due to the password requirements. 1) Any additional options or considerations added to the guest checkout flow is a potential obstacle for users on their road to completing their purchase. By delaying account creation until the confirmation step, users won’t have to evaluate account benefits or make up their mind about whether or not they should create an account — they can move directly to finalizing their purchase. Generally speaking, any opportunity to delay users’ choices until after the sale has been closed creates a checkout flow that is easier to complete and, more importantly, feels easier to complete for the end user. Furthermore, saving account creation form fields until after users have checked out reduces the number of form fields users encounter during checkout, which leads to a general increase in the usability of the checkout. It’s easy to create an account at Crate & Barrel. After completing the checkout, users simply have to create a password. Furthermore, note the sole password requirement of “4–18 characters”, making it more likely users can use their preferred passord — making the process nearly frictionless. 2) There’s often a misalignment in the perceived extra friction of creating an account and the actual extra friction. Creating an account mostly only involves setting a password, with one or two password fields to fill out. All other contact, address, and payment data have to be entered to place a guest-based order anyhow. 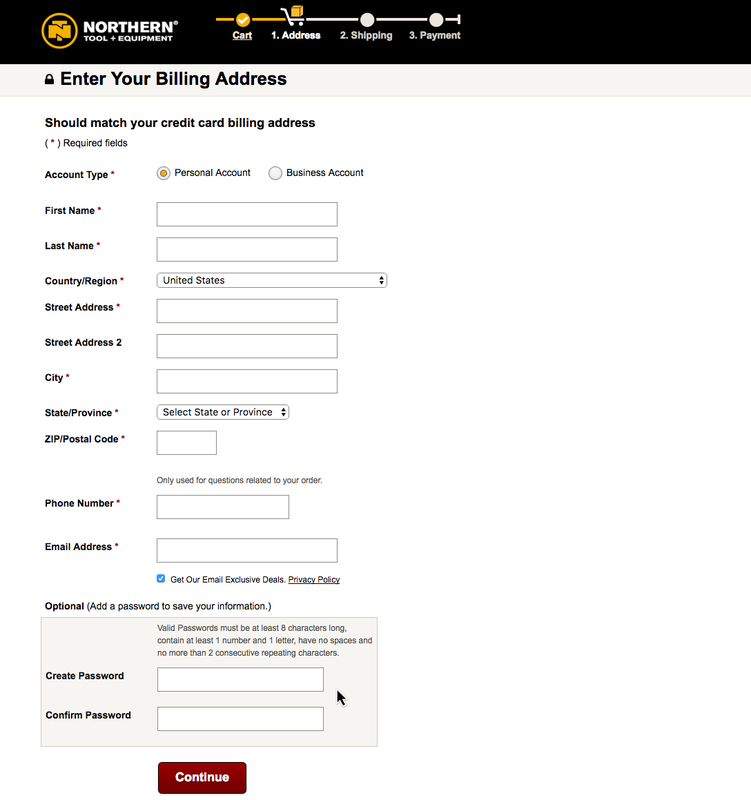 However, in practice we observe that users who opt, or are forced, to create an account in the very beginning of the checkout flow often then associate the majority of the form fields in the checkout flow with account creation, instead of understanding that they’d be required to fill out these fields regardless of whether or not they created an account. Checkout flows that use “Delayed Account Creation” avoid this level of perceived extra friction, as the only form fields users will see after being asked to create an optional account is the 1–2 password fields. While the actual checkout friction is the same, users’ perception of the checkout friction differs significantly. L.L. 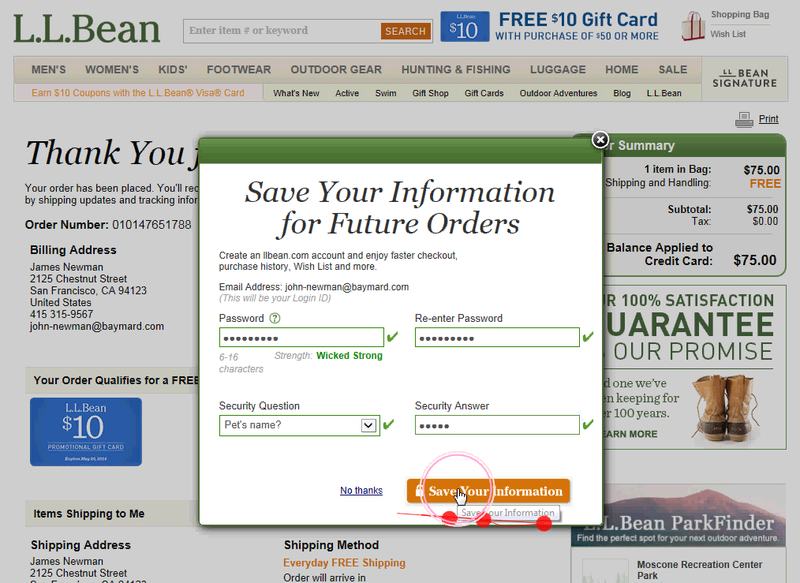 Bean forces users to choose whether or not they want an account by using an overlay at the “Thank You” page. While it’s an aggressive approach (and not something we generally recommend), since the order’s already been placed, there’s no risk of immediate checkout abandonment. 3) When delaying optional account creation until after the order has been placed, sites can use a design and wording that more strongly encourages users to create an account. If users are nudged too forcefully to create an optional account during checkout, some may perceive the account to be required instead, and the site then runs the risk of some of those users abandoning their purchase. Therefore, if users are asked to create an account during checkout it needs to be extremely clear that account creation is optional. On the other hand, at the confirmation step the user’s order is complete: hence, sites can use styling and wording that more actively nudges users into creating an optional account, since there’s no longer a risk of abandonment. 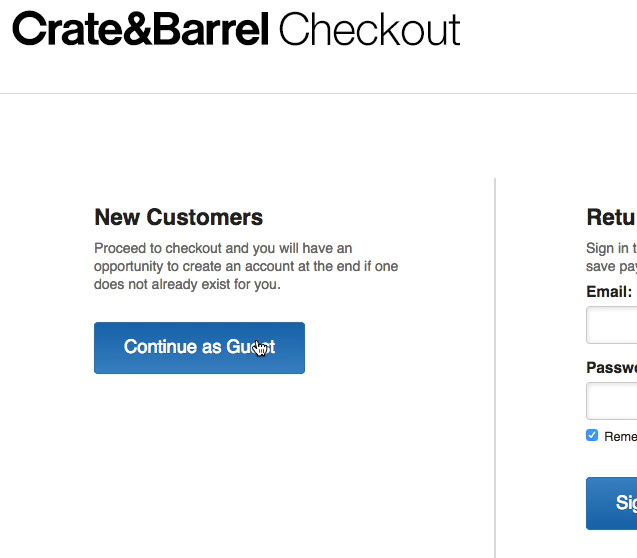 Crate & Barrel lets users checking out as guests know that they will have an opportunity to create an account at the end of the process. Furthermore, one implementation detail observed to be important when allowing users to create an account at the confirmation step is that users should be alerted at the “Account Selection” step that they’ll have an opportunity to create an account at the end of checkout. This is important as users who suspect they will be repeat customers will often want an account, and telling them that they can create one after checking out will put them at ease, and avoid causing them to hunt for the account creation form before beginning checkout. A simple, short description for the guest checkout option (e.g., “You’ll have an opportunity to create an optional account at the end of checkout” ), at the “Account Selection” step, will often suffice. 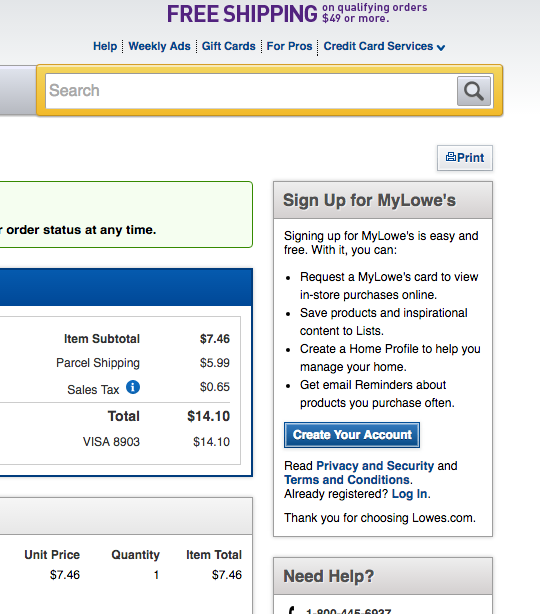 Lowe’s offers a list of reasons why users should create an account at the confirmation step. Many users with existing accounts understand the benefits, but new users may need to be enticed. Testing revealed that including a list of reasons at the confirmation step is the best solution. These benefits in particular should be communicated to users when asking them to create an optional account at the confirmation step, along with other site-specific account features. It’s important that account creation doesn’t get in the way of the primary goal during checkout — helping users complete the checkout efficiently and with as few distractions as possible. Yet 24% of sites ask users to create an optional account during the checkout flow, and 14% of sites force users to create an account to even check out. Some users who are adequately nudged at the confirmation step to create an account will realize the benefits of faster checkouts and easier order management, while sites are likely to see repeat purchases from more loyal users who’ve created accounts. But users must be asked at the appropriate place, and be given sufficient reasons for why creating an account would be beneficial. Authored by Christian Holst. Published on February 6, 2018. What uplift in account creation could we expect to see through this recommendation? Hi Gavin, we could provide a generic/avg. number but refrain from it as it wouldn’t be representative for what the individual site can expect. The increase in optional account creations will fluctuate greatly depending on the site’s target audience, what account creation flow/design you have now, and what benefits you offer for users if they create an (optional) account. Beyond any increase in the percentage of optional account creations, a large part of the benefit with using ‘Delayed Account Creation’ is removing friction form the actual checkout flow – so the success of this is as much measured in the decrease in checkout abandonments for ‘guest checkout’ users. Individual user accounts are a core feature of e-commerce I agree with this statement of yours.we should focus on Delayed Account Creation’ as it removing friction from the actual checkout flow.